Touting questionable products like magnetic insoles and “negative-ion” sanitary pads, Shu Yuhui built a business empire that brought in an annual revenue of 19.2 billion yuan ($2.82 billion) at its peak and included hospitals, a traditional Chinese medicine theme park and a professional soccer club. All that came to an end in December, when a viral article published by Chinese medical news site Dingxiangyuan alleged a 4-year-old with cancer had died in 2015 after taking herbal products advertised by Shu’s Quanjian Group as cancer cures. 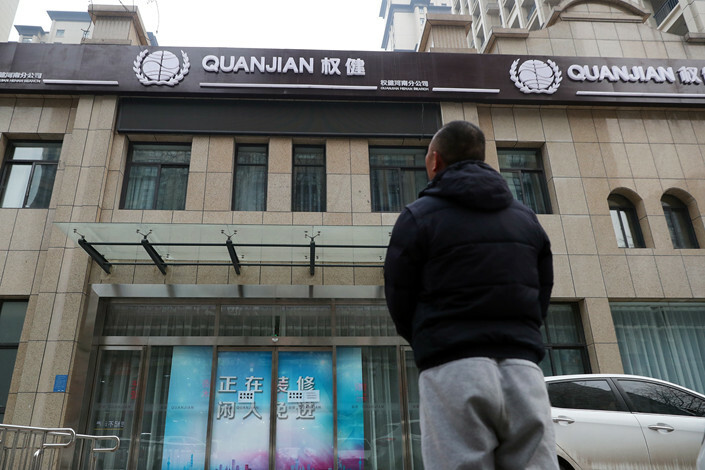 Police began investigating the company on Jan. 1, and eighteen suspects from Quanjian, including Shu, have since been detained, accused of crimes ranging from false advertising to organizing a pyramid scheme. Quanjian, founded in 2004, has a direct marketing license from the Ministry of Commerce, and describes itself as China’s largest direct sales company. But Dingxiangyuan’s expose raised the question of whether the company is in fact operating a pyramid scheme, which were outlawed in China in 2005. Caixin’s efforts to contact the company for comment failed. The key difference between a pyramid scheme and direct marketing is whether the company’s profit depends on selling products, or only on expanding its headcount, Yang Fan, a lawyer at Guangdong Ford & Ford Law Firm with experience in fraud cases, told Caixin. China’s regulations prohibiting multi-level marketing say it’s illegal to calculate members’ performance rewards based on the number of new members they can recruit, or to make members pay entry fees or buy a minimum quota of products in order to become distributors. 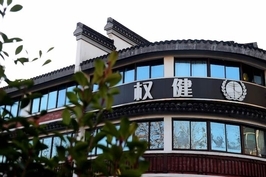 In order to become an “ordinary distributor” for Quanjian, you must first buy seven pairs of Quanjian’s “Guzhengji” magnetic insoles, which have a retail price of 1,068 yuan per pair on the company’s website, according to training and publicity materials obtained by Caixin from multiple WeChat and QQ chat groups. Distributors are able to earn commissions based on Quanjian’s sales incentive system, and also have the opportunity to learn “fire therapy” skills free of charge and buy products for half price, the publicity materials said. Distributors also earn varying amounts of money for bringing on different numbers and combinations of new distributors. Quanjian’s bonus system is complicated, with hard-to-achieve but attractive-sounding rewards. “This is so they can draw you in, without letting you see the flaws. 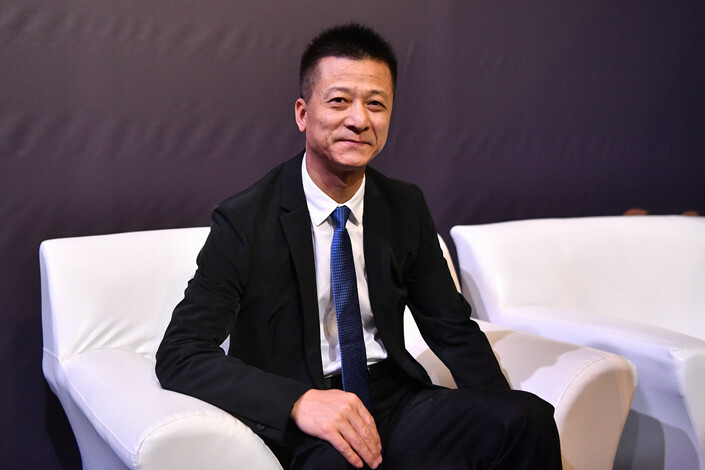 Once you get confused, you’ll start to only think about hitting the targets, and you won’t calculate how much you will make in the end,” Liu Shuang (not his real name), who said he had been selling for Quanjian for six years, told Caixin. Liu said he still knew little about many parts of the system, adding that people higher up in the network — whom he referred to as “teachers” — spoke vaguely about the process and were reluctant to give specifics. "Selling products was not a goal, but just the bait. The ultimate goal was to expand the headcount downward. You only sell products if you’re no longer able to keep developing downward. It’s difficult and expensive,” another distributor said. Little public information is available about company founder Shu. According to Quanjian lore, the 51-year-old was born into a family of traditional medicine practitioners, and was obsessed with collecting secret folk remedies as a child. One book published by Quanjian with a preface by Shu said he had graduated from Beijing’s prestigious Tsinghua University in the early 1990s, although, according to multiple media reports, no one with the name of Shu Yuhui or Shu Bihe (an alias he has frequently used) was on Tsinghua’s alumni register. But locals in Yubei, the village in the Jiangsu province city of Yancheng where Shu grew up, painted a less glamorous picture of his upbringing. Some Yubei villagers told Caixin that Shu’s parents were actually farmers, and that the family was poor. Shu was a “very ordinary and earnest” child, they said. After graduating from middle school, he became an electrician at the local machinery factory, which he left in the 1990s. “He must have felt he had no future at the factory,” said one woman in Yancheng who told Caixin she had previously worked alongside Shu. Outside of Yancheng, Shu made his first forays into multi-level marketing (MLM), which was becoming popular in China in the 1990s with the entry of American companies like Amway and Avon. Shu worked as a seller in Nanjing, the province’s capital, people from Shu’s village told Caixin. When the Chinese government began cracking down on MLM companies, he returned to Yancheng and worked as a beer salesman, but left town again after disgruntled clients from Nanjing arrived in Yancheng to demand money from him, they said. Shu eventually moved to Tianjin, a port city near Beijing. According to multiple Chinese media reports, he worked at Tianjin-based MLM company Tiens Group, which sells dietary supplements, for some time. Public company documents show that, in 2000, Shu set up two other companies, before founding Quanjian in 2004. Quanjian gained fame on the back of Shu’s “fire therapy,” which involves setting a towel on fire over a patient’s afflicted body parts. Shu claimed this could treat chronic conditions such as diabetes. The company became more widely known after it announced in 2015 that it had acquired the soccer team then known as Tianjin Songjiang, which was soon renamed Tianjin Quanjian. Quanjian Group’s revenue grew to a total of 1 billion yuan in 2017, up from 548 million yuan in 2015, according to public records. Tianjin Quanjian changed its name to Tianjin Tianhai in January after news emerged of the investigation into Quanjian, Xinhua reported. Quanjian’s East China regional headquarters are located in Dafeng district, Yancheng. When Caixin reporters visited the Quanjian Life Science Industrial Park, an area that includes Quanjian’s headquarters, the place appeared desolate. Staff at restaurants, grocery stores and towel stores — towels are a key part of fire therapy — were clearing their stock, while some people were seen removing the name “Quanjian” from signs advertising fire therapy. It wasn’t always like this. A man named Lin at one of the stores said that before the collapse of Quanjian Group, teams of Quanjian distributors visited the park every day. “The surrounding venues and rooms would be fully booked, and many teams would even have to look in surrounding areas for meeting rooms and places to stay,” Lin said. Inside the industrial park, there was a Quanjian-branded shopping center, a Quanjian International Equestrian Club, a Quanjian Chinese Medicine Theme Park, and a Quanjian Youth Soccer Training Base, among other facilities. While the current government investigation into Quanjian is mainly focused on Tianjin, Quanjian’s business activities in Yancheng have ceased, a Dafeng official told Caixin. The official said he was unable to say whether Quanjian had voluntarily shut down. Despite the ongoing scandal, people in Yancheng seemed ambivalent about Shu. Staff at the industrial park said it had brought at least 3,000 jobs to the district. “Either way, he never cheated us Yancheng people. He only cheated outsiders,” a local taxi driver said.